Back in the 1950’s Dad & I would fish lakes up in Northern Minnesota or Northern Wisconsin. Dad had a 4 horsepower Neptune… possibly a 1938 model when I was very small. 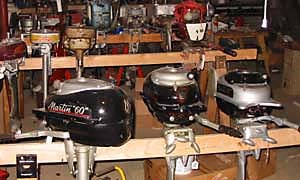 He later sold that reliable old Neptune to a family friend and purchased a new 1951 14 horse Evinrude Fastwin from Stirn’s marine in the Chicago area…I thought that shiny new Evinrude would fly. Well…compared to the old Neptune, it would. 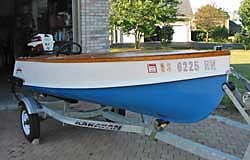 We fished many great lakes with that Evinrude like Crane Lake or Winnibigoshish but the Evinrude always got us home. I remember a day when Dad went out for a day’s fishing and I elected to stay at the cabin and do some shore or pier fishing. As usual I did what suited me best…slept late. Dad would get up at sunrise, fish until dark with a short break for lunch…I, on the other hand preferred to get up at 10, fish a little, catch a lunch and go out for a couple of hours. One could honestly say that dad was a much more dedicated fisherman than I was at that age. It wasn’t till many years later that I became an avid fisherman. I guess spending half the season fishing and owning 3 boats somehow qualifies me…anyway, on that day I woke up and did a little shore fishing and when most of the boats came in for lunch, I walked the shore where they were all pulled up on the sand. 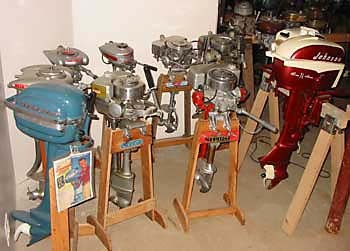 I marveled at the different styles of motors. There were green Mercurys’, a blue Champion, blue Evinrudes’ and several green, & a few maroon & cream Johnsons’, a pair of silver Waterwitches and the one that caught my eye was a black Martin…shiny and fast-looking. I never forgot those motors. I wondered for years how they ran. One day when my kids were grown up and out of the home, I decided that I was going to seek out one of those mysterious looking Martins, clamp it on my boat and see how it ran. I put an ad on Lakelink.com advertising for one. Several day later I got a response from a fellow who lived in Rockford who, in a phone conversation, explained that his dad had sold his Mercury dealership in Markesan Wisconsin years earlier to Jerry’s marine but kept a barn full of trade-ins. We agreed to meet up at his place and look at what he had for sale…Well…I was like a kid in a candy store! All those motors hanging off the racks and best of all…they were all for sale. I came home with a car-full of motors. I immediately started disassembling and tuning these motors up. Lo and behold …I got one running like new…that was it! I was hooked. I started collecting Martin parts, then Neptune motors and finally any under-10 horse OMC I could get my hands on. Even tho my Walleye boat has a 4-stroke outboard, my small-lake Alumacraft still has a 57’ Johnson QD as my regular fishing motor. It’s amazing to me how my fishing buddies marvel at how well the old QD starts and runs. 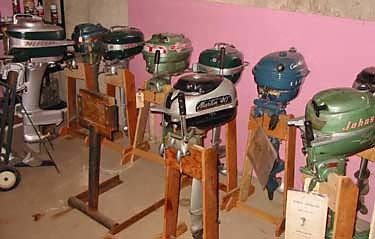 Since we moved into our new home, I have managed to collect over 50 vintage outboards. It’s a good thing to have an understanding wife!